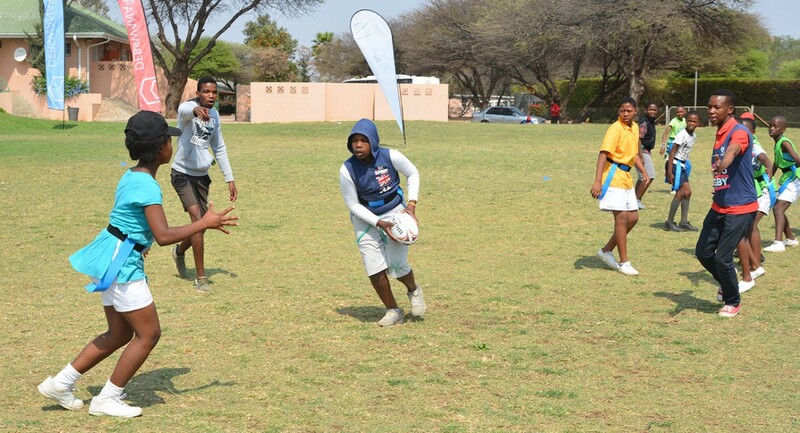 Rugby grounds belonging to Debswana’s Jwaneng diamond mine are the home for a third rugby centre supported by the country’s Re Ba Bona Ha programme. Debswana, a joint venture between De Beers Group and the Government of the Republic of Botswana, has already invested P6.5 million in the programme. Jwaneng mine’s Services Manager Isaac Tswetla called on local teams to make good use of the rugby facilities and to host international games there. Re Ba Bona Ha is a grassroots skills development programme that seeks to introduce children, aged between eight and 18, to sport. It was piloted as a project in Gaborone in 2002 in the sport of football. Later, the programme was rolled out to other sports including cricket, rugby and volleyball. Debswana would continue to invest in sports development, he said, including the First Division League and encourage its employees to participate in sports by making available sporting facilities, finance and transport. Over the last 12 months, Debswana has sponsored the Netball World Youth Cup to the tune of P1.2 million, as part of a P4.2 million sponsorship package for Re Ba Bona Ha, which is run by the Botswana National Sports Commission (BNSC). It also handed over boxing equipment such as gloves, head guards and punchbags worth a total of P23,000 to a junior secondary school in Lobatse. Debswana has also provided support through the programme to judo (in Gaborone), karate (Tsabong and Kasane), chess (Francistown) and basketball (Gaborone) competitions, as well as to other rugby events (Zimbabwe and Maun). At the opening of the third rugby centre (the other two are in Selebi-Phikwe and Maun), the BNSC donated rugby equipment worth P21,000 to the Jwaneng rugby centre, and the town’s deputy mayor Olga Ditsie said the dream was to turn the mining town towards sports tourism. The Re Ba Bona Ha programme relies on volunteer coaches as well as volunteers from the Botswana Sports Volunteer Movement and the BNSC, and is managed by each specific sport, with the BNSC as the overall overseer. BNSC Chief Executive Officer Falcon Sedimo said the aim of Re Ba Bona Ha was to nurture talent and promote sports development among promising stars. He added that Jwaneng had good rugby grounds courtesy of Debswana’s Jwaneng mine and it was down to the administrators and players to put them to good use. And he praised stakeholders, especially Debswana, for investing in the future stars of the sport.